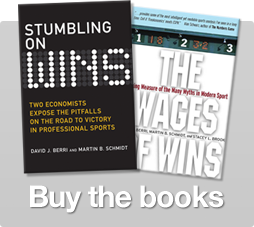 Once upon a time, I wrote virtually every story at The Wages of Wins Journal (Editor’s note: Dave currently has 1484 posts attributed to him. That’s over a thousand more than the next closest author). During the NBA season, many of these tales began with the Wins Produced numbers of a particular NBA team. Since apparently I was the only one who fully understood how to calculate Wins Produced (although I thought the steps were clearly explained in The Wages of Wins), I was the only person who could write these stories. And then along came Patrick Minton. Once Patrick put together theNBAGeek.com – which reports every player’s Wins Produced throughout the season – no one had to wait for me to report on their favorite team. If you wanted to know the productivity of a specific player, all you had to do was look at Patrick’s website. For example, want to know what LeBron James has produced this season? The NBA Geek tells us it is 19.1 Wins Produced. Don’t believe LeBron has played mostly power forward this season? In the past you were stuck with my position assignments. But now, The NBA Geek tells us that LeBron produced 22.7 wins if he is a small forward. With such a brilliant website, who needs me? Well, one group that still seemed to need me (at least, once in a while) was journalists. For example, Tom Van Riper – of Forbes.com – wrote this story about overpaid players in the NBA in 2010. And about a month later, Tom wrote a story about underpaid NBA players. And then in 2012, Dan Bukzpan of CNBC.com also wrote an article about overpaid NBA players. Each of these stories began with these reporters asking me to do some analysis. So I had a sense that I was somewhat useful. Last Friday, though, Tom Van Riper demonstrated that I wasn’t even needed for this kind of analysis. Tom wrote a story – with help from theNBAgeek.com (but no help from me) – detailing the most overpaid players in the NBA this season. The list – which you can see in its entirety at Yahoo.com (in other words, Yahoo skips the slide show) – has generated a bit of discussion. Both Alan Raskin of the Star Ledger (Newark, New Jersey) and Mark DeCambre of the New York Post commented on Carmelo Anthony appearing on the list. Gabe Zaldivar at the Bleacher Report also focused on Melo’s appearance. Dirk Nowitzki’s appearance on the list led to a comment in the Dallas Morning News. The Dallas Morning News also commented on Chris Kaman’s name on the list. By the way, you might recall that we criticized the signing of Kaman before the season started. And Mark Cuban – Kaman’s boss – objected to our analysis (see the comments on Ari Caroline’s post linked to above). Well, now that the season is over, it appears we might have been on to something. There is a video of Jackson’s reaction at NBA.com. Unfortunately for Jackson, there is also data on Jackson’s career at theNBAGeek.com. And that data suggests that Jackson was not often underpaid. Back in 2002-03, Jackson was paid about $700,000 and he produced 5.4 wins. But beyond that season, it looks like Jackson has generally been overpaid throughout his career. And this is not surprising. Jackson has generally been an inefficient scorer. Such players tend to be overpaid in the NBA. At least, once upon a time I did some analysis that told that story. 17 Responses to "Someone Else Telling the Story about the Overpaid in the NBA"
Unfortunately with the recent high efficiency high volume scoring Melo has had over the past week, fans are more sensitive to claims that he is overrated and overpaid. Its sad that people have to have the short term memory of a goldfish and the selective memory of a… well… sports fan. What i don’t get is how, for a majority of players, your “wins produced” number is roughly the same with the Kubatko’s “win shares” number and for some players, there’s a huge difference ? For 8 of 10 players, there’s no bigger difference than -+2wins, for 1/10, there’s a 3wins difference and for Carmelo Anthony, 8 WINS !!! How is that possible ?? Without going into much detail, what make those two stats differ so much for a few players ? Wins Produced and Win Shares are sibling stats that are quite similar to each other. The main difference is that Win Shares has a larger team adjustment. The Knicks have a good record, so a lot of the wins that should be attributed to Tyson Chandler and Jason Kidd are taken from them and spread out amongst their other teammates (like Melo). If you look at the Wins Produced leaders and Win Shares leaders, you’ll notice that there are fewer Win Shares leaders at the top (say, past 10, or 9 wins). Win Shares are flatter: fewer players at the extremes and with a smaller range. Thanks Devin for the details. – over 8.5 wins produced : 34 players. – over 8.5 win shares : 22 players. That makes the difference between the win shares and the wins produced of Carmelo Anthony even bigger. He is 28th in win shares while 224th (!!) in wins produced ! And I fully comprehend the fact that Chandler’s and Kidd’s wins are spread to the others, but while the other players gain from 0 to 1.5 wins, Melo gains ~8 !! I have not searched for other players with a similar gap between the two numbers but the Melo one seems kind of unique. and 7.1 wins : Anthony !! So Anthony is really an outlayer. What could be the reason(s) ? There are two forms of boxscore “Advanced stats”. PER and Win shares rely on “human knowledge” to tune the weights. In Win Shares case, Dean Oliver at least recognized the value of shooting efficiency and defense. Win Shares heavily reward offensive play, particularly shooting. Melo is scoring well this season. As Devin mentioned, Win Shares has a huge defensive team adjustment. For another fun exercise look at the range on all players Defensive Win Shares vs. the range on all players Offensive Win Shares. Understand that “Defense” in Win Shares eyes will include stats directly attributable to individuals (rebounds). Melo has the perfect world of being good at the stat Win Shares loves and on a team that gets a huge boost from defensive rating. Andres, if I am interpreting the scare quotes around human knowledge correctly, what you’re really saying is PER and Win Shares are cooked, bogus, corrupted for popular consumption. Maybe it’s professional courtesy to not say as much, but methinks this should be trumpeted from the hills. Bogus stats are worse than naive stats. Points scored in isolation may not be indicative of value, but at least it’s not a lie. This site pretty well has trumpeted from the hills that PER is a bogus stat. Dre’s comment has a fair amount of historical subtext, but WoW hasn’t been shy about calling a spade a spade. Searching the site for Hollinger/PER should be illuminating. Win shares is a bit different. It was best of breed for its time and was a precursor to Wins Produced. It also is much less widely adopted, so has been shown a higher level of reverence. Plus, it is substantially better than PER, which has some egregiously bad attributes. I think the inclusion of Dirk shows the limitations of the positional adjustment. As Prof. Berri mentioned, one can look at Dirk’s numbers at NBA geek with his position as a Small Forward, that increases his WP by well over 50%, from 3.4 games to 5.6! As I understand it the primary justification for the positional adjustment is ‘stretch,’ which is fine. But idea that the average small forward provides enough marginal increase in stretch over Nowitski to justify that sort of value adjustment seems like a stretch in itself. Dirk is overpaid, but he probably wouldn’t be in our top 10 (we’ll revisit this at the end of the season). So I don’t see how that “shows the limitations” of the positional adjustment. The reason for the difference when you switch Dirk from a SF to a PF is that the average level of raw production changes. PFs are more productive than SFs. This is all purely based on the numbers. It shows the limitations because there is an implicit assumption that all power forwards play the same way and have the same attributes and the same with small forwards, and whatever the ineffable stretch factor that convinces teams to keep the statistically less valuable positions on the floor is the same for each and every one. I don’t really have problem with the stretch idea, but using the cardinal positions for rigid categorical adjustments is a bit of a kludge to be honest. There is no assumption — implicit or otherwise — in the WP position adjustment that all the players who play a certain position must play the same way. All the position adjustment does is compare the productivity of players who play the same position. For example, you could have a very productive centre who never rebounded, as long as he made up for it in other areas. While Ari’s posts on the “stretch” factor are interesting, at this point this factor remains entirely theoretical. If you have a better way of comparing players, let’s see it. Devin- No reason to get defensive, I worked software development long enough to know that sometimes a kludge is the best available solution. If that’s true there is no justification for a position adjustment, but your latest Bargnani post and the site’s “How to” page both belie that claim. If a player or system plays their position further outside and handles the ball more than is ‘typical’ of their position the position adjustment may overly penalize them. If “play[ing] their position further outside and handl[ing] the ball more than is typical [for] their position” causes a player to be less productive — as measured by said player’s boxsscore stats — then yes, the position adjustment penalizes them. I wouldn’t, however, call this “overly penalizing” them, as they have indeed become less productive. Productivity is not about ability. We’re not measuring how good players might be, we’re looking at their actual production. Alright Devin I think we’re mostly in agreement, now. But if a stretch four plays further outside and that allows the small forward, like Marion who is a combo forward to play closer to the basket there’s potentially no loss of team productivity Or conversely, if Nowitski played closer in, his productivity may rise, but the net team productivity may not. In other words, like shot taking, if a player is takng inside space they are taking it away from their teammates. With players who play their position in the more traditional fashion the positional adjustment does a good job of capturing that dynamic, but I think it necessarily has some limitations with players who don’t fit the traditional positions. Lastly, your point on productivity vs ability is a good one, which sometimes gets lost. KG, for example, has a much lower we this year because he’s listed as a center. But, a part of the productivity loss is that the Celtics essentially play big stretches with no one playing inside as a center on the offensive end.